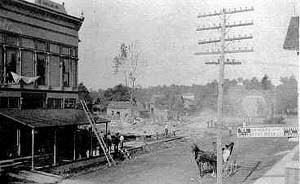 Near midnight on the night of October 25, 1912, a fire in the downtown section of Greens Fork destroyed several business establishments and for a time threatened the entire town. It was believed the fire was started by an arsonist and a man was taken for questioning but nothing was proven and he was released. Here is the newspaper of Saturday, October 26, 1912. 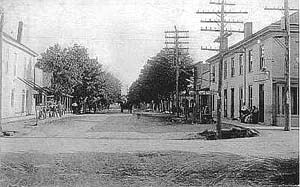 As a result of a conflagration of incendiary origin, which wiped out the business blocks on the southwest corner of Main and Pearl streets, about midnight last night and caused a total loss of about $20,000, partially covered by insurance, Harry Cory, a restaurant keeper, in whose store the fire is thought to have started, was arrested about 2 oclock this morning by Sheriff Steen and Deputy Sheriff Miller. He was taken to the county jail at Richmond and held on suspicion of arson, but no formal charge was preferred either by the officials or any of the residents. The blaze, similar in many respects to that of July 18, when the business section on East Pearl street suffered a total loss of approximately $25,000, burned so briskly that the business houses were in ruins within an hour after the fires discovery. C.W. Kienzle, hall, $3,600, insurance, $2,200 grocery stock, $800, insurance on stock, $800. Thomas Dean, $1,000 stock in 5 and 10 cent and millinery store in Kienzle block, insurance $500. William Brooks, restaurant keeper in Kienzle block, $200 to $300 stock, $150 insurance. William Roller, two business blocks, $5,000 hardware stock carried, $5,000 insurance on buildings and stock, $3,600. Dr. J. B. Willis, druggist, in Roller block, $1,000 stock carried. Amount of insurance not known. Harry Cory, restaurant keeper, small stock of goods; no insurance carried, it is understood. Post office, in Roller hardware store; loss not known, but will be heavy, it is believed. Mrs. Hannah Bradbury, residence, $1,400, $600 insurance. Earl Stevenson, barber, Kienzle hall; loss small, covered by insurance. Knights of Pythias lodge, in Kienzle hall, furniture loss $300; covered by insurance. The paraphernalia of the lodge was saved. 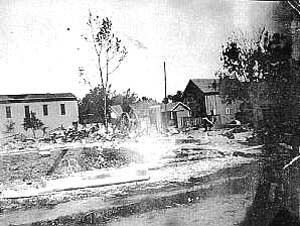 The Nicholson hall, southeast corner of Pearl and Main streets, barn belonging to William Roller and basketball hall owned by H. H. Fagan, caught fire, but the blazes were put out before much damage had been done these properties. The entire town was threatened with destruction, but by great effort the residents and farmers for miles around who were called in were able to confine the blaze to the business blocks. A fire engine which was purchased by the town following the fire of July 18, when the business section in the other end of the city was destroyed, aided materially in confining the conflagration. Thomas Dean, Dr. Willis, Earl Stevenson, and Harry Cory, who were burned out in the previous blaze, and had just gotten well established in their new locations when burned out last evening. The charred business districts here now cover a larger territory than those which remain. That suspicion should be cast against Cory is due to his strange actions. After discovering the fire last evening and sounding the general alarm, he helped others fight the blaze for a time and then suddenly disappeared. About 2 oclock this morning he was found lying in the yard of Mrs. Enos Veal, about 200 feet from the scene of the blaze. He appeared to be unconscious, and on the trip to Richmond with the sheriff and deputy feigned he could not talk, but when Richmond was reached he suddenly became loquacious and protested his innocence. In the fire of July 18, Cory, who a few months before had attempted suicide at the home of relatives in East Germantown, was found in his restaurant on East Pearl street, supposedly asleep. It was necessary to break in the building and carry him out. 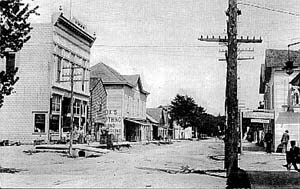 In the case of the fire in July the blaze started behind the drug store of Dr. Willis, which adjoined the quarters occupied by Cory. In that fire, it was the general impression that coal oil had been used to kindle the blaze, and the theory has always been held by Greens Fork residents this fire was of incendiary origin. The grand jury, which investigated it is understood, was unable to find any evidence to substantiate the theory. The blaze last evening started in the rear of the building occupied by Willis and Cory and the odor of coal oil was most noticeable. The alarm of fire was sounded about midnight by Cory who had retired but a short time before. Cory maintains he was awakened by the noise of the briskly burning timbers. In the excitement of the moment little attention was paid to Cory by the other residents. Corys absence from the scene of the fire was not discovered until the buildings were smoldering embers. Then a search was made for him and he was found unconscious in the yard of Mrs. Enos Veal. It is said that he maintained he was overcome by the smoke and fainted. Whether the arrest of Cory on suspicion will result in charges being preferred is not known. The authorities, including Superintendent of Police I. A. Gormon, of Richmond, Sheriff Steen, Deputy Mote, Deputy Miller and Prosecutor Allen are now investigating, along with adjusters of insurance companies. The suspicion that fire bugs have been operating this community had long existed, due not only to the fires here, but those to residences on farms in this community. Three houses have burned within as many months, including the home of Seth Lucas, three miles north of here, in which Mrs. Lucas lost her life. So far as can be learned Cory had no enemies here and he had never expressed a grudge against anyone. The department officials at Richmond were asked to assist, but owning to the fact the steam engine was out of order and the automobile truck was not equipped with any but chemical fire fighting apparatus, the request had to be declined. Greens Fork has no water works system and the water supply adequate for fire fighting must be forced from the wells here and the river. However, the effectiveness of the bucket brigade last night was such that the assistance of the Richmond company probably would not have added much. The residents, men, women, and children perched themselves on the roof of the adjacent buildings which were not already on fire, and continually threw water on these structures and kept them from catching fire, while an equally large force was kept busy carrying water from the wells and the river. Women as well as men assisted at the pumps and in carrying the water in every available receptacle to those located on roofs. Several persons were affected by the heat but none seriously. No one was badly hurt in falls from roofs. Efforts were made as long as possible to remove the furnishings from the doomed structures and several different character were saved. The Knights of Pythias were able to save their records and paraphernalia valued at several hundred dollars in this way. Just what postal supplies will be saved, will not be known for a day or two, when an inspector makes an investigation. Postmaster Will Roller placed all stamps and postal supplies of a Valuable character in the safe last evening before he closed up, and until the safe has been opened and the contents inspected, it cannot be determined the extent of the damage to Uncle Sam. The post office was opened temporarily in quarters across the street today. There were 40,000 postcards burned. Dr. Willis and several other residents here, were in Richmond last evening attending the political meeting when word reached them that the town was burning up. They secured automobiles and made a hasty trip here. The curious were drawn for miles around, this town being the automobile center of the county this morning.